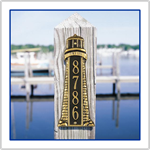 Nautical address plaques are handcrafted in Michigan (by Whitehall Products). 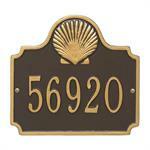 Compliment your waterfront home with a house number plaque having a seaside, beach, or boating theme. Personalized address plaques make a great gift! 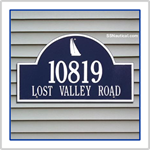 Our nautical address plaques and address markers are made of recycled, rust free, cast aluminum. And are finished with durable, weather resistant finishes. 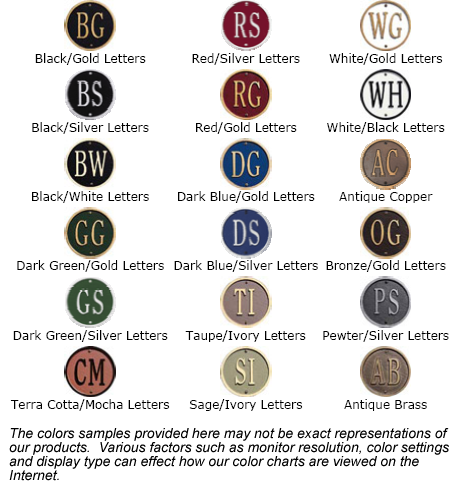 Whitehall Address Plaques are available in many different color combinations. 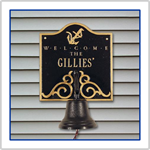 Personalized Anchor Welcome Plaque with Bell. Two line arch design with raised anchor image. This is a nautical inspired anchor address plaque. Whitehall address plaques are made of recycled, rust-free, cast aluminum, and finished with durable, weather-resistant finishes. This is a nautical inspired sailboat address plaque. Whitehall address plaques are made of recycled, rust-free, cast aluminum, and finished with durable, weather-resistant finishes. Arch design with raised sailboat image. This is a nautical inspired seagull address plaque. Whitehall address plaques are made of recycled, rust-free, cast aluminum, and finished with durable, weather-resistant finishes. Rectangle design with raised seagulls on a pier image. One line text. This is a nautical inspired seagull address plaque. Whitehall address plaques are made of recycled, rust-free, cast aluminum, and finished with durable, weather-resistant finishes. Rectangle design with raised seagulls on a pier image. 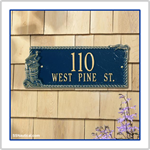 This is a one line, nautical inspired anchor address plaque. Arch design with raised anchor image. Whitehall address plaques are made of recycled, rust-free, cast aluminum, and finished with durable, weather-resistant finishes. 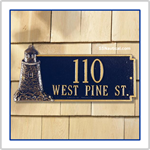 Large Size - Lighthouse nautical address plaque with weather resistant finishes. 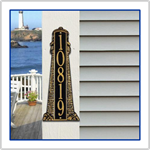 Dress up your beach house, cottage, or seaside home with an lighthouse address plaque. 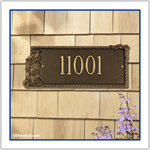 This one line conch shell address plaques are made of recycled, rust free, cast aluminum and finished with durable, weather resistant finishes. Nautical shell address plaque will compliment your homes nautical decor. 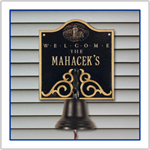 Our nautical inspired conch shell address plaques are made of recycled, rust free, cast aluminum and finished with durable, weather resistant finishes. This shell address plaque will compliment your homes nautical decor. 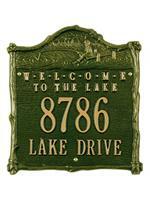 This is a two line Adirondack Arch address plaque. Whitehall address plaques are made of recycled, rust-free, cast aluminum, and finished with durable, weather-resistant finishes. Rectangular design with raised sailor's knot image. Lighthouse address plaque, nautical inspired for your beach house. Lighthouse image with one line of text. Whitehall address plaques are made of recycled, rust-free, cast aluminum, and finished with durable, weather-resistant finishes. Nautical inspired one line sailor's knot address plaque. Whitehall address plaques are made of recycled, rust-free, cast aluminum, and finished with durable, weather-resistant finishes. Rectangular design with raised sailor's knot image. This is a two line nautical inspired sailor's knot address plaque. Whitehall address plaques are made of recycled, rust-free, cast aluminum, and finished with durable, weather-resistant finishes. Rectangular design with raised sailor's knot image. This hunting inspired address plaque and address marker is made of recycled, rust-free, cast aluminum, and finished with durable, weather-resistant finishes. Featuring a retriever running (splashing) in the water. Great gift for the hunter, outdoorsman. Get one for the duck hunter you know. This would be an excellant accent to your home or house on the lake. Featuring three ducks in flight. Young boy fishing off a dock inspired address plaque. Whitehall address plaques are made of recycled, rust-free, cast aluminum, and finished with durable, weather-resistant finishes. Rectangular shaped address plaque with a fishing themed design. Specialty plaque. This would be an excellent accent to your home or house on the lake. Featuring toasting Beer Mugs with two lines of text. Great addition to your house, deck, boat, or bar. This is a cabin inspired address plaque. Whitehall address plaques are made of recycled, rust-free, cast aluminum, and finished with durable, weather-resistant finishes. 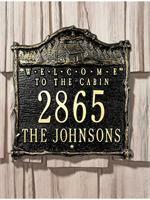 Rectangular shaped address plaque with a log cabin themed design. Specialty plaque. This would be an excellent accent to your home or house on the lake. Featuring a BBQ Grill and two lines of text. Great addition to your house, deck, boat, or bar. Specialty plaque. This would be an excellent accent to your home or house on the lake. Featuring a Margarita with two lines of text. Great addition to your house, deck, boat, or bar. Specialty plaque. This would be an excellent accent to your home or house on the lake. Featuring a Martini Glass with Olive and two lines of text. Great addition to your house, deck, boat, or bar.